Probiotics that helps support gastrointestinal health. Each capsule contains 6.5 billion active cells, concentration guaranteed until expiry date. Any adult who has been previously treated with antibiotics, that has digestive problems (such as bloating, constipation and/or diarrhea) or intestinal problems (such as Crohn's disease or irritable bowel syndrome) or who is vulnerable to infections would benefit from taking probiotics to maintain their health. In addition, environmental changes (food processing, air pollution and our fast-paced society) affect the balance of the intestinal microbiota and thus undermine protection against pathogenic bacteria. Our Adult probiotic contains no less than 7 human bacterial strains, including Bifidobacteria for the colon and Lactobacilli for the rest of the intestinal tract. Any adult who has been previously treated with antibiotics, that has digestive problems or intestinal problems or who is vulnerable to infections would benefit from taking probiotics to maintain their health. How to take Probaclac ? Taking probiotics on a daily basis allows to fully profit from their health benefits and will help people who suffer from digestive disorders, people who are taking antibiotics or just those who want to have a healthy digestive system. 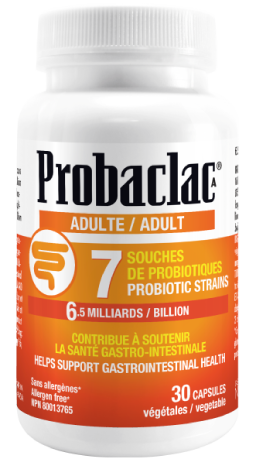 The Probaclac probiotics range has been proven for more than 20 years and has been used in hospitals, they are also recommended by pharmacists, doctors, nurses, nutritionists and other health professionals. 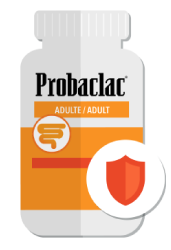 Probaclac probiotic Adult formula is free of priority allergens and is therefore suitable for all.